KUALA LUMPUR: The government plans to turn cyber games or E-Sports into a new industry that can generate revenue for the country in the future, at the Asian and international level. Prime Minister Datuk Seri Najib Tun Razak said this is in line with the development of the industry with the involvement of the younger generation who made it a source of income and to fit in with their new lifestyle. “I was told that cyber games will feature at the Asian Games in Indonesia this year,. Perhaps this sport can go up until the Olympics. “Embracing it as a new industry will promise a variety of opportunities, and not just entertainment and lifestyle. However, we must prepare our people to become the generators, the suppliers and active players in cyber games,” he said when speaking at the launch of Malaysia Cyber ​​Games 2018 (MCG18) at Putra World Trade Centre (PWTC) here, today. Also present were Communications and Multimedia Minister Datuk Seri Dr Salleh Said Keruak, Malaysia Book of Records (MBR) founder Tan Sri Danny Ooi and Kelab Suara Anak Muda 1Malaysia president Datuk Armand Azha Abu Hanifah. Najib said the government was aware of the needs and desires of youths for today and future needs by supporting efforts to diversify E-Sports programmes and expand them across the country. “We need to embrace the change in the digital economy and the fourth revolution. This is the new lifestyle of young people. The government must be youth-oriented based on future needs and undergo change. “We must be a government that cares and understands young people, their language and serve their needs and aspirations,” he said supporting Armand Azha’s suggestion that Malaysia Cyber ​​Games (MCG) be recognised as an association representing E-Games in this country. 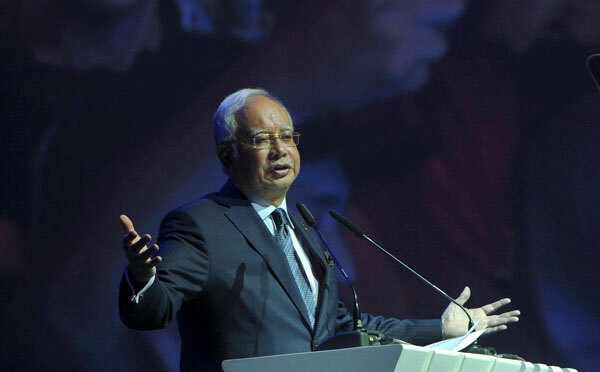 At the event, Najib witnessed MCG18’s recognition by the Malaysia Book of Records as the largest video game in the country by hosting nine video games and with the participation of 2,062 players. MCG18 is organised by Suara Anak Muda 1Malaysia dan Briged Kesatria and offers RM300,000 worth of prizes. In the tournament, the players have fight in nine popular video games for two days starting yesterday.